Interestingly, Rayo's ultras, the Bukaneros chooses to side with Depor's Riazor Blues, rather than with Celta's Celtarras. And yet Celta is perhaps where we should look for inspiration, because of two signings that happened in the summer of 2011 - Michu and Roberto Trashorras. The beat of the metronome. Its sound is drowned by the cheering fans yet everyone sees it. And the man controlling the frequency feels it. Knows it. Understands it. As the ball approaches him his eyes see the previous beat and his mind sees the next. The ball arrives at his feet. For a split second - a second that is easily missed to the naked eye, every single player slows down. Time slows down. His eyes don't need to look around - the snapshots are firmly ingrained in his mind. He knows what to do. And once he does, the play keeps ticking. He dribbles, or passes, or holds on to the ball. But whatever he does, whatever decision he makes, that split second changes everything. Strikers start make runs. Teammates start create passing lanes. Wingers run into space. If the opponent is not careful, that single split moment can destroy them. 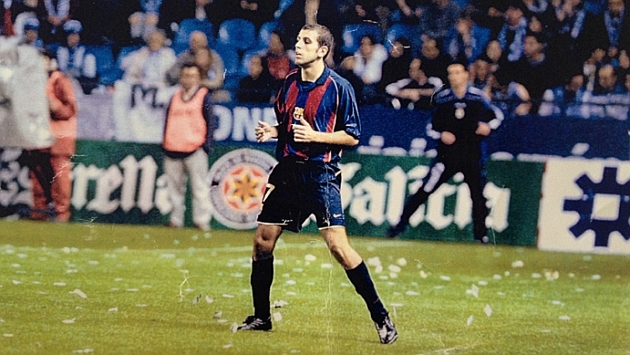 Roberto Trashorras took his first steps in Barcelona back in 1996, when he was only 14 years old. He recalls living in a flat of four in La Masia because it was only at the age of 18 that players were allowed to look for a flat of their own. His eight years there coincided with Guardiola, De la Peña, Puyol, Reina, Valdés and Iniesta. On August 8, 2001 he made his first team debut with Rexach in a Champions League qualifying match against Wisła Kraków. It was 86 minutes when he entered the field for Luis Enrique, the current coach of Barcelona. A few days after that European experience, on October 7, 2001, Trashorras made his league debut against Deportivo, this time entering the field in the 68th minute for Alfonso Pérez. His time at Real Madrid coincided with Arbeloa and Beckham, but he didn't get any first team opportunities for two years there - despite helping Real Madrid B to a promotion to the Segunda. After eight years at Barcelona and two at Real Madrid, Roberto Trashorras was at a crossroads. He was 24, unemployed and forgotten. Barcelona had picked him up from boyhood club Racing Vilalbés at the age of 14, and his resemblance to Juan Sebastián Verón earned him the nickname la brujita del mini. He had started out as a striker but was converted to a playmaker by Barcelona B coach Quique Costas due to his knack of assisting goals. However, after just two first team opportunities, and a Jorge Valdano-influenced move to Real Madrid resulted in two dull seasons at Real Madrid Castilla left Roberto in serious doubts. Racing Vilalbés, his boyhood club, would take him back in a heartbeat. Watch out for part 2 tomorrow, for the rest on Roberto Trashorras' story.